Tony Mathews, senior pastor of North Garland Baptist Fellowship, Garland, Texas, was one of the plenary speakers. He emphasized that short-term mission trips provide IMB missionaries needed encouragement and build bridges to unreached people groups. 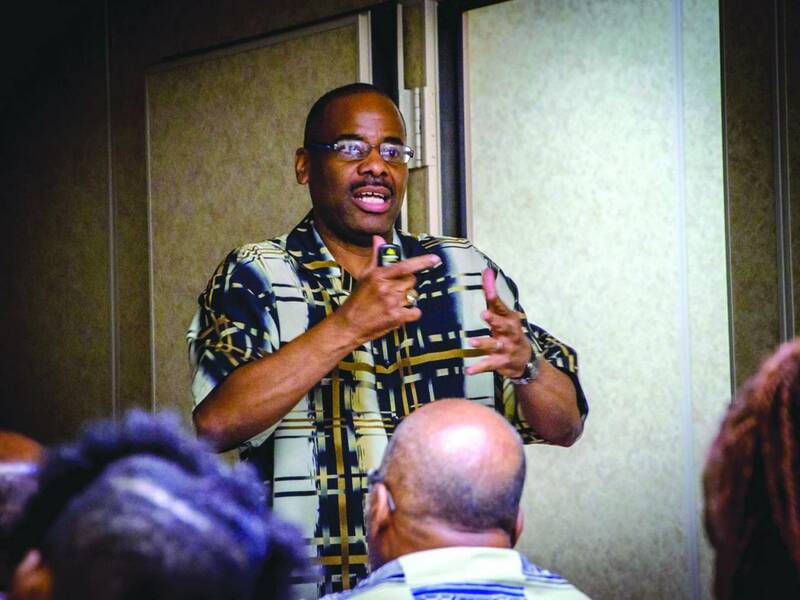 NEW ORLEANS – When it comes to international missions, the African American community may be “a sleeping giant,” said Keith Jefferson, IMB African American missional church strategist, at a recent IMB Forum at Franklin Avenue Baptist Church, New Orleans. The event highlighted that the time is now and the opportunity great for African American churches to invest in international missions. While a lack of missions education and exposure has been a damper to African American participation in the past, the tide is changing. “[Awareness] is beginning to grow,” Jefferson said. Fred Luter, Jr., host pastor, told the group of mostly African American lay persons and pastors that he participated in his first international mission trip – to Africa – while president of the Southern Baptist Convention. Luter served as president from 2012-14. Stories from IMB leaders of Africans that asked, “Where are the people who look like us?” convicted him, Luter said. Featured speakers included Tony Mathews, senior pastor of North Garland Baptist Fellowship, Garland, Texas and Robert Williams, pastor of The Path Worship Center and director of Miracle Making Ministries, Inc., Augusta, Ga.
Mathews leads mission teams to Africa, India, and Ecuador where Afro-Ecuadorians, descendants of slaves, sense a kinship with African Americans, Mathews said. With trips logged to more than 30 countries, Williams leads teams to Africa where he hopes his partnerships with missionaries there will “build a Christian buffer and slow the growth of Islam,” he said. Jefferson said the African American community can capitalize on the fact that people around the world follow African Americans celebrities such as Michael Jackson, Michael Jordan, Beyonce, and others, to gain audience for the gospel. Jefferson told the group he was 41 years-old when he met an African-American missionary for the first time. Two years later, he and his wife were appointed IMB missionaries to Brazil where they served for 16 years. “A person shouldn’t be 41 and meeting their first [African American] missionary,” Jefferson said. While the event focused on African American involvement, speakers stressed that every Christian is called to service. Mathews emphasized that short-term mission trips provide IMB missionaries needed encouragement and build bridges to unreached people groups. Williams told of a lesson he learned while in seminary that God had not called him to a ministry “confined to a pulpit,” but that he needed to take the gospel to those in need. Williams directs Miracle Making Ministries of Augusta, Ga. that includes the Zaccheus Project, a healthcare arm of ministry that treats 7,000 patients per year. Compassion ministries meet needs, but the primary task is leading others to Christ, Williams said. “Most of all, we preach the gospel,” Williams said. On his short-term mission trips, Williams trains indigenous believers to share the gospel with their own people. Williams told of a young woman in Africa whose parents drove her away from home and out into the jungle when she came to faith in Christ. She told him, “I love Jesus…I’m not turning back,” Williams said. Her continued growth in the faith is evident every time he returns to her city, Williams said. When asked about the recent budget changes at IMB that netted staff cutbacks, Jefferson said IMB’s commitment to send missionaries remains strong. “We don’t know what the future looks like, but we have a president [David Platt] who wants to send tens of thousands of missionaries around the world,” Jefferson said.